Cities Connection Project | COUPE GORDON-BENNETT. VERNIER, GENEVA. This project explores the notion of town planning in a peripheral zone through a morphology of courtyard buildings which blurs the boundaries between the architectural object and the urban fabric. Following a competition won by the LRS practice, the project proposes five courtyard buildings of ascending height which, by their layout, create a district with a dense urban character and a sequence of varied public spaces. time creating a wide range of public spaces, ambiences and typologies. For the four residential buildings, the courtyard is the point of entry to the property from the mall. 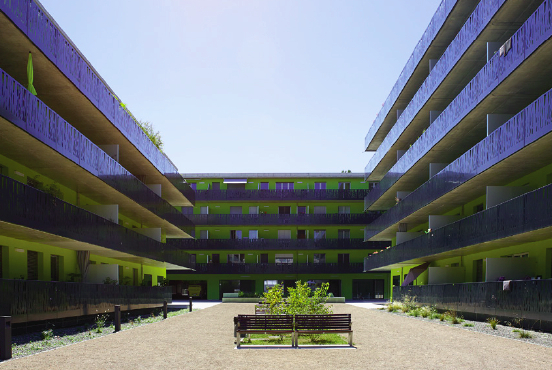 The layout of the courtyard, together with the arrangement and typology of the residential units, are unique to each building. In particular LRS has developed the “Scirocco” building. In this case the courtyard as the setting for socialisation between neighbours groups together various workshops and small commercial units, as well as all six entrances to the stairwells. Its proportions guarantee pleasant intimacy and brightness for the accommodation. The 87 residential units available for rental are spread over 5 floors and 1 attic floor. 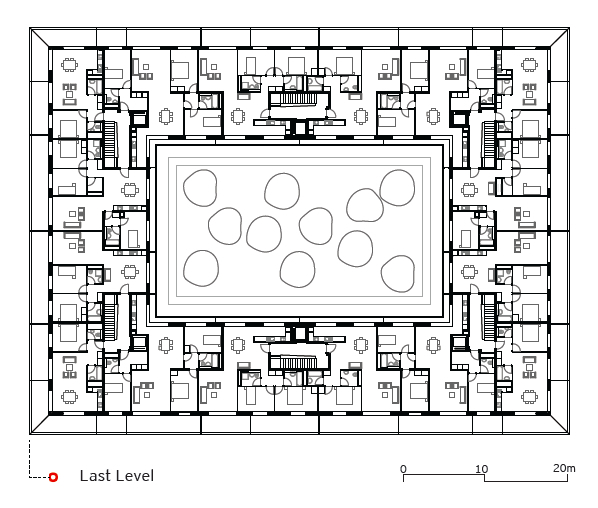 The traversing typology adopted means that the kitchens face the courtyard and the living rooms the surrounding estate.